“Old Africa’s Last Refuge” – Botswana is a truly wild destination, and the Great Wing Safari Botswana highlights three unique destinations on a rotating circuit via bush plane jumpers and includes game drives, canoeing wet safaris, exciting game walks and more. Special 2 for 1 Premier Level, Belmond Luxury Lodges, valid for travel November 15 – December 23, 2018 and January 01 – March 31, 2019. From $7,495 for two travelers, land arrangements. Botswana is known as “Old Africa’s Last Refuge”… a never-never land where the beasts roam free as they have done for millennia. 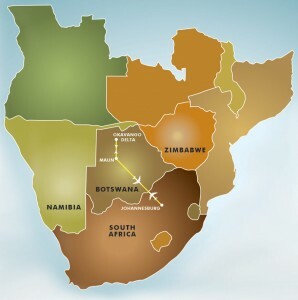 The landlocked nation is blessedly underdeveloped, thanks to the severe Kalahari desert that blankets half the country under wind-blown sands. With a small human population (including some of the last remaining Bushmen), Botswana is truly a ‘wild’ safari destination and the setting for the Great Wing Safari Botswana. Unwind and refresh in Johannesburg before winging to the small frontier town of Maun. Excitement starts immediately as your bush pilot maneuvers the light aircraft over the vast Botswana wilderness at an altitude that allows for aerial game viewing on the Great Wing Safari Botswana. Two nights will be spent at each of three distinctly different Botswana camps that are unique in design and personality (most are tented) and are located in specific ecological enclaves that offer a smorgasbord of activities. “Water” camps specialize in wildlife activities aboard boats and mekoros (canoes). The fauna focus is birdlife, hippo, crocodiles and other wetland species. Often on the menu are exciting walking safaris. The “land” camps are seriously into the pursuit of the big land mammals. Open 4×4 vehicles allow you to get so close to the wildlife that you can leave your zoom lenses behind! Whether you are a first-timer or a seasoned safari aficionado, Botswana’s spectacular wildlife legacy never fails to set the heart pumping and the cameras clicking on the Great Wing Safari Botswana. If you have more time to explore, consider adding a Victoria Falls stopover, or a visit to a lodge in the fabulous Hwange Park. An overnight flight to South Africa … and the excitement begins. Welcome to Africa! Relax at your airport hotel and fall asleep under African stars. Six glorious nights at three different camps. Encounter huge herds of buffalo, elephant and zebra … favorite prey for hungry lions, cheetah and leopard. Witness survival of the fittest on daily game drives in open safari vehicles, conducted by professional safari guides. 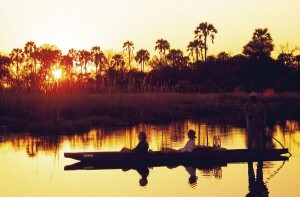 Ply the delta waterways in mokoros (canoes) on the watch for hippo and crocodiles. At midday, thrilling walking safaris offer amazing photographic opportunities. At night, exciting game drives are assisted by powerful spotlights. The evenings draw to a close with sumptuous feasts under starred heavens, serenaded by the night-time bush calls. Shake off the bush dust, wing back to Johannesburg and board your departure flight. Floating down the great Chobe River experiencing the natural wonders synonymous with Africa’s raw wilderness.